It is not easy to get a good cup of flavor rich and perfect coffee. If you are a lover of best flavor and aroma filled coffee, then you will always be on the lookout for the ideal grinders that help you make a tasty coffee. A regular traveler who loves to drink the freshest coffee must carry a portable coffee grinder with him. The machine must be very easy to use and provide you with the perfect coffee grind that you want. Not all coffee mills are the same. They differ in size, function, material, and warranty. You should always look to get a hand coffee grinder that is sleek and cylindrical in shape so that it takes less storage space in your travel bags. This will make it a highly portable unit and can be carried anywhere you go. Grinders are made using all kinds of materials with stainless or ceramic grinders or any other durable grinder is considered to be the best option. The machine must offer consistent, easy and feature-rich functions that will help in grinding the best coffee always. Choosing the manual grinder that offer long term or lifetime warranty is the best option. 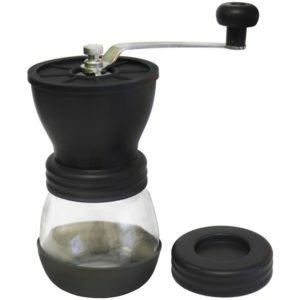 The Hario Skerton Ceramic Coffee Mill is a pocket-friendly manual coffee grinder that is easy to carry and use for all fresh coffee loving travelers. 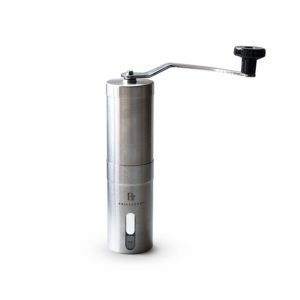 This hand coffee grinder is very easy to clean and is a no-nonsense machine that only knows to churn out coffee ground to meet the tastes of fresh coffee lovers. The unit comes with conical burr grinder that ensures that the sizes of the coffee grounds are identical. It weighs 1.2 pounds and is made using glass with ceramic burrs inside. The ergonomic design and the grind precision offered by this coffee grinding machine make it a favorite among many coffee enthusiasts. As it is made of ceramic materials, it is very easy to clean. Disassembling and reassembling the product is not a tough task at all. It comes with a slip-free rubber base that ensures that coffee grinding is not a tough job. The Kuissential manual hand crank coffee grinding machine is an attractive looking machine made using ceramic materials. It will perfectly complement any office or home kitchen. It is lightweight and portable and is a must for every coffee lover who loves to brew his or her own coffee. You get a great consistency of coffee grounds as this machine uses the burr technology to grind the coffee beans. The flavor and the coffee consistency are maintained in every ground cup you make using this machine. There is less friction and heat generated using this manual grinding machine and therefore the oils of the coffee beans will not be evaporated. This gives you tasty and flavorful coffee every single time. The unit is very quiet while in operation and can be cleaned very easily. 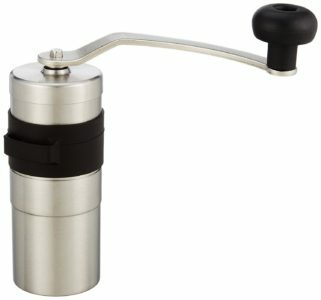 You can grind ultra-fine to French press coarse coffee using this hand crank machine. The grinder has a lid for the hopper that prevents the beans from jumping out while grinding. 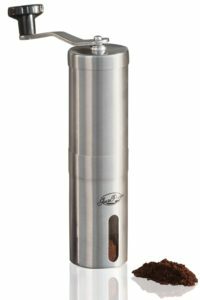 If you are looking for an affordable, easy to use and quality hand coffee grinder to get the best ground coffee always, then the JavePresse coffee grinder is a very good option. This machine has a conical burr grinder that ensures that you get precise ground coffee that you want. It ensures proper and right kind of coffee grinding always and thanks to its 18 different clock settings, you can grind coffee beans to suit various ground coffee options like the French press, Turkish coffee, espresso coffee, cold brew, Keurig K-cup, pour over, etc., in your home. The unit is cylindrical in shape and is made using brushed stainless steel for great durability. The combo burrs sued in the machine are ceramic and they will last 5 times longer than the stainless steel blades. It is an ideal travel partner for everyone who loves to drink freshly brewed coffee and is perfect for camping, outdoor trip and hiking enthusiasts. 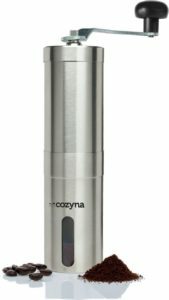 The Cozyna stainless steel manual coffee grinder is a very handy machine to have in your home or office if you love to drink fresh ground coffee every time. This machine comes with ceramic burrs that ensure that the flavor and the aroma of the coffee beans are locked in the ground coffee. These mills will also make sure that every coffee bean is ground to precise size and perfection without letting out any of the essential oils in the coffee beans. The final outcome is that you get to drink tasty and flavor-rich coffee any time of the day or night. The ceramic conical burrs will help in adjusting the grind size depending on your need. Just turn the burr clockwise and anticlockwise to get the perfect size for your coffee drink. The unit is lightweight, sturdy, and rust-free and can fit into an Aeropress. It carries a lifetime warranty. The Kyocera Advanced ceramic coffee grinder is a multipurpose unit that can be used to grind fresh coffee, pepper, salt, sesame seeds and green tea. The use of a ceramic grinding mechanism ensures that the aroma and flavor of the coffee beans are not lost and thereby you will always get aroma filled coffee ground. The use of ceramic mills ensures that it will last a long time and does not rust at all. They will have a longer life. The unit comes with a non-slip base that ensures stability when you are grinding the coffee beans. The grind size is adjustable and therefore you can prepare coarse to fine coffee grinds easily. The ground coffee is collected in a reusable glass container. It has the capacity to store up to 100 grams of ground coffee. This container is dishwasher safe. The unit is handy, very ease to operate and to clean. The Brilliante manual coffee grinder is the handy coffee machine that allows you to adjust the grind size to get consistent ground coffee all the time. It will support multiple brewing methods like a French press, Espresso; pour over, percolator or Turkish, depending on your coffee needs. This hand coffee machine is very easy to operate and comes in a stainless steel design and style that makes it look very attractive. It will only occupy very little of your kitchen counter space and is designed to be used while traveling. 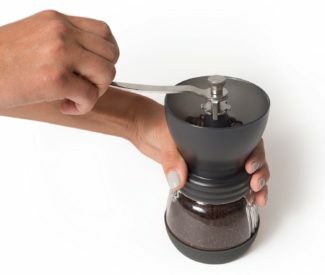 You can grind up to 38 grams of coffee in under 2 minutes time. The crank handle is long and easy to grip and this aids in quick and easy grinding. The machine is very quiet in operation and prevents any static build-up, thanks to its stainless steel body. The unit just weighs 254 grams and has dimensions of 7.5 in x 1.89 in. 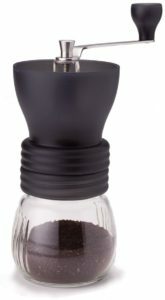 The Porlex Mini stainless steel coffee grinder is a sturdy, handy and easy to use a coffee grinder that makes coffee grinding an easy job. The unit is fitted with ceramic conical burrs to offer you even coffee beans grinding at all times. It has the capacity to grind coffee beans to support multiple brewing methods like espresso, French press and also ultra-fine coffee powder. The inner spring of the grinder will ensure that you get grind consistency always. The machine is 130mm tall and 47mm in diameter and hence can be easily carried in your hiking, camping or travel bags. The unit is made using high-grade stainless steel and it is also a static free material. The use of silicon in the middle of the unit helps you to have a firm grip on the machine when you are manually grinding the coffee beans. The ceramic burrs are rust-free, durable and are very easy to clean. The Premium ceramic burr manual coffee grinder is an attractive looking and affordable coffee grinding machine that gives you a perfect cup of brewed coffee like what you get in a barista. It provides you with more control over the coffee grind to produce uniform size and the required grind size for your preferred brewing method. This is a portable unit and therefore you can have freshly brewed coffee anywhere. It makes use of dual ceramic conical burrs that offer precise coffee bean grinding. The burrs will last a long time and are also very sturdy than the traditional stainless steel blades. There will be no heat produced when grinding the coffee beans using the ceramic conical burrs and therefore the delicate benefits of the coffee beans are intact in the ground coffee. All the parts of the product are washable and the remainder of the coffee ground can be stored in the container by sealing it with an airtight cap. 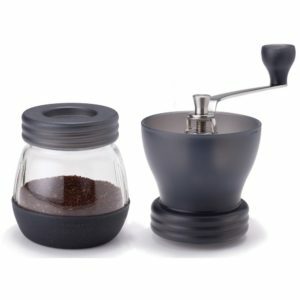 The use of manual coffee grinders is not limited to traveling and is also widely used by many people to grind the coffee beans to enjoy their morning ritual of tasting a hot and fresh cup of coffee. Each of the hand coffee grinder mentioned above has something unique about it. When you are choosing a coffee grinder that you want to use regularly, then the type of materials used in making the product, the cost of the product, its durability, ease of use and warranty has to be given due consideration. This way you will be able to buy the most suited coffee grinder that will serve you for years.